For my own centerpieces, I knew I definitely wanted something that would last–I hated the idea of it dying and fading away…it just felt like a bad vibe for a wedding. 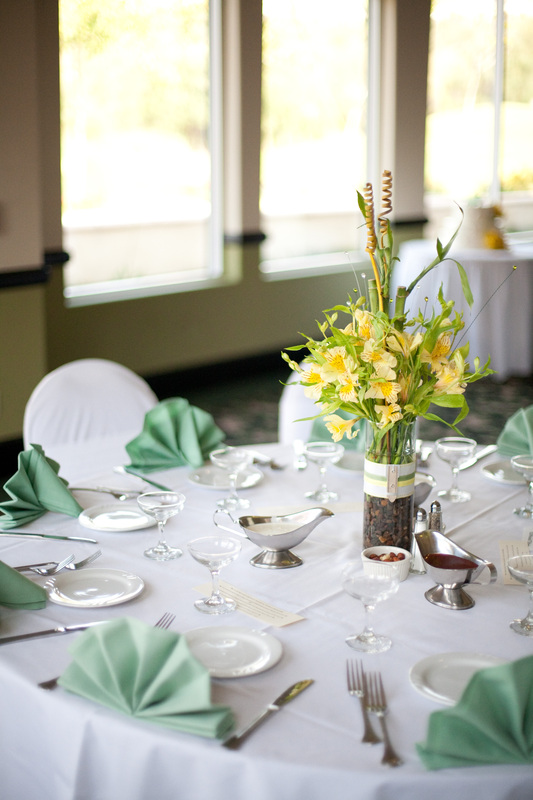 So using lucky bamboo in my centerpieces was an easy decision for me. Lucky bamboo (which actually isn’t bamboo at all), is a great plant because it’s so easy to care for (good news, since I didn’t want my guests to have a difficult plant to keep alive, like say, an orchid). I ordered my bamboo in bulk from an online retailer, and got tall vases from the Dollar Tree store. I decided to plant the lucky bamboo in pebbles and water, so I bought a large bulk bag of pebbles from Home Depot, and gave them a rinse with the garden hose in the backyard. To “dress” up the centerpieces for the wedding, I added my decorative beads on wires, as well as decorative dried reeds I got from the Dollar Tree store. They came in two varieties: spirals (seen above), and swirls (seen below). 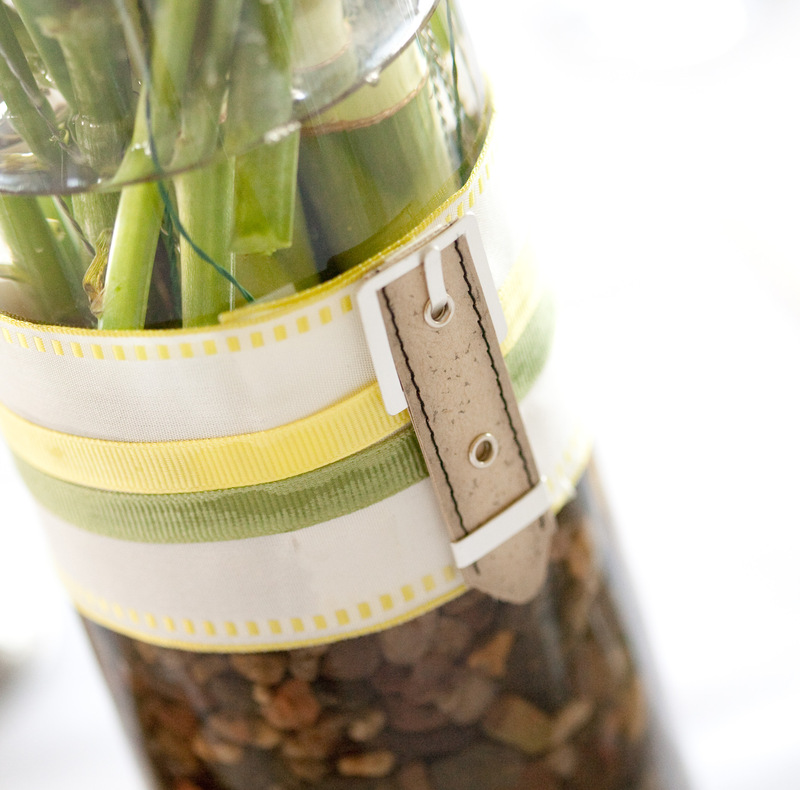 I also wrapped each vase with white, green, and yellow ribbons, and added a “buckle” embellishment from the local craft store to tie into the “travel” theme of my wedding. Since these were “living” arrangements, I was able to make them well ahead of the wedding, and they simply hung out in the dining room where there was plenty of bright indirect sunlight to keep them happy. On the day of the wedding, the vases were taken to the wedding venue. 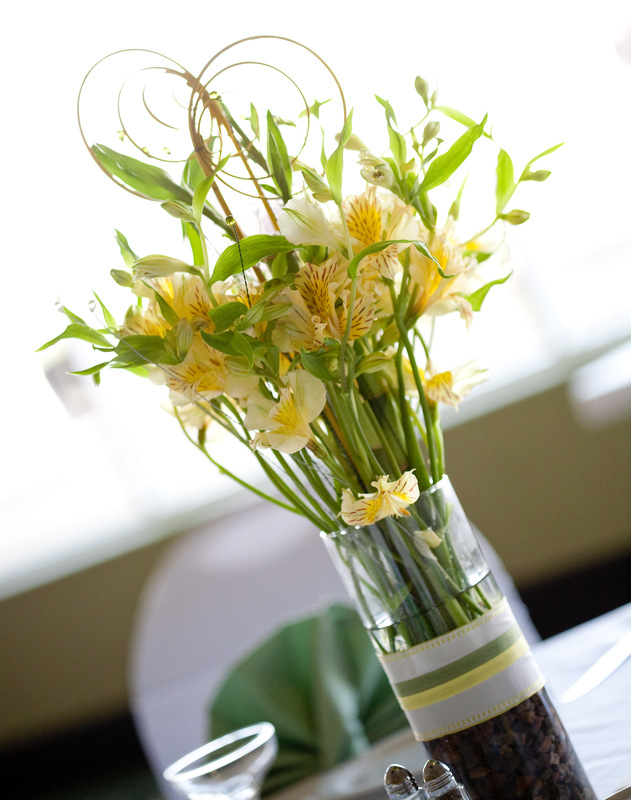 Only then were the flowers added–about 10-12 stems per vase. Overall, I was really happy with my centerpieces: they still featured flowers, but more importantly, they were arrangements that could continue to live happy, photosynthesizing lives. The practice one I had made for my parents is still alive and well, six years after its creation! To determine who could take one home at the end of the reception, I devised a little game for each table. The guests had to guess how many miles my husband and I had collectively flown together during our various travels, and write their answer on a card. During the reception, I announced the correct answer, and the guest with the closest guess got to keep the centerpiece. Needless to say, I was a fan of The Price is Right as a kid! To wrap up this post, I want to express my deepest gratitude for the help of my friends. This is one of the projects they helped me tackle by coming over for a big wedding crafting day, and we accomplished this task in no time through assembly-line efficiency! Reblogged this on mz jenny lee.